Chicagoans are a pretty lucky group of boaters. In addition to a stunning cityscape, plenty of open water to play in, and dockage available all along your coastline, a magical spot right on the river awaits for your next excursion. After spending a day getting the lay of the land in Chicago, I took a walk down the river toward Island Party Hut. 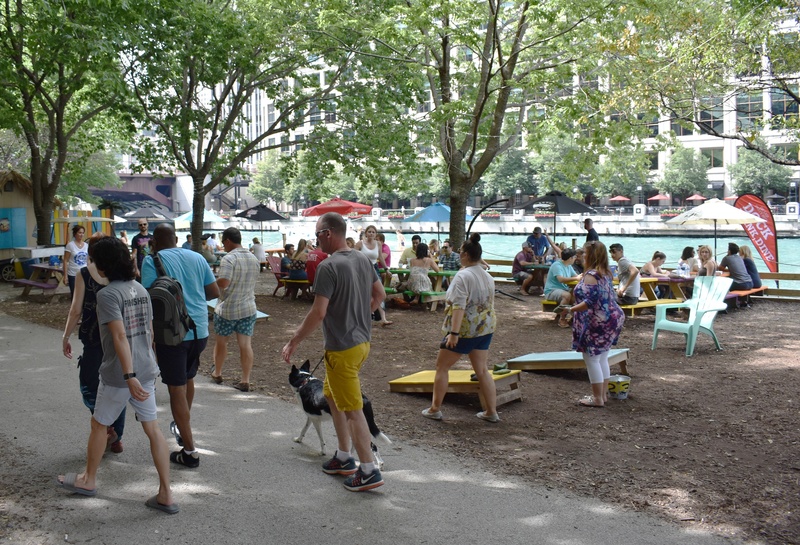 From the water, boats pull up, tie off, and hop up to the Chicago Riverwalk toward the music to find themselves suddenly in a sea of picnic tables, games, and other happy Party Hut goers. 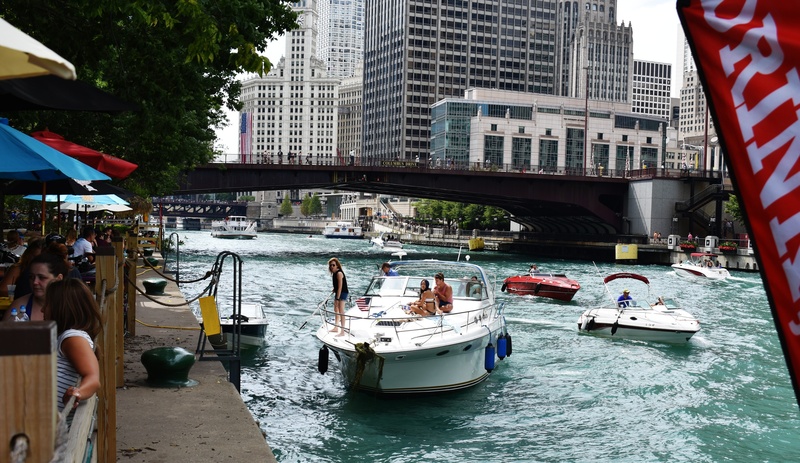 While 5pm was quitting time for many Chicagoans, the boating scene was just getting started. The docks and hut were hopping with friends, families, raft-ups, and rounds of drinks. 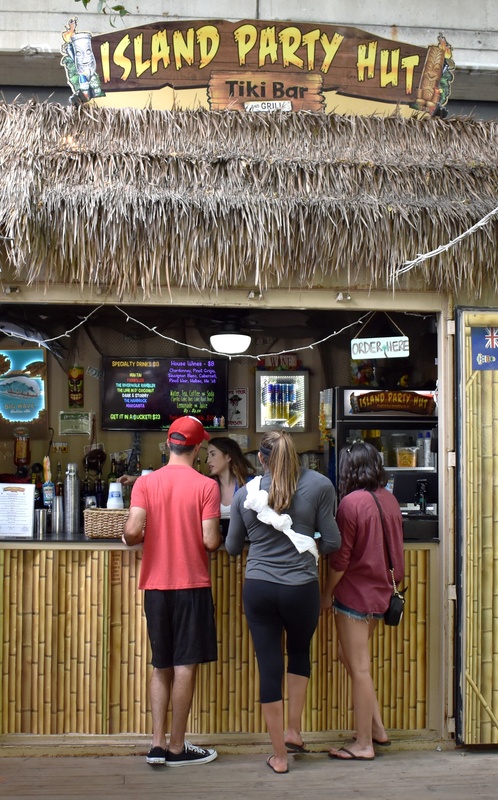 Because of its location and laid-back atmosphere, Island Party Hut is slightly reminiscent a family barbecue in the backyard – except unlike your backyard, the tiki bar never closes and the drinks are way better. As mentioned previously, the Chicago River has had quite a bit of pick-up in traffic over the last 5-10 years, so captains need to be hyper-vigilant about other boats and small craft. Particularly here, as the Urban Kayaks rental company runs its operations just yards west of the Island Party Hut wall, so as you approach you'll spot a handful if not dozens of bright green kayaks puttering around. Island Party Hut has its operations down-pat. Since coming on board with Dockwa last summer in their 2nd year of operation, they've welcomed hundreds of vessels in search of a new daytrip and/or easily-boat-accessible nightlife. Space on the wall is available for reserving in 2-hour periods, and a staff member is always on hand to help you pull up. Since they're a busy bar & restaurant, imaginary bonus points go to boaters who message in-app with their updated ETAs. 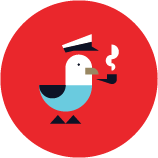 They're also happy to accommodate last-minute arrivals without reservations; you'll just be asked to create your Dockwa account once your vessel is secured to pay and reserve. The people make the place. You could be boating in the most pristine harbor with the best marina amenities, and if the staff is rude or apathetic, that's what you'll remember. You won't find negativity in this riverside haven; the team behind Island Party Hut has set the stage for awesome time. 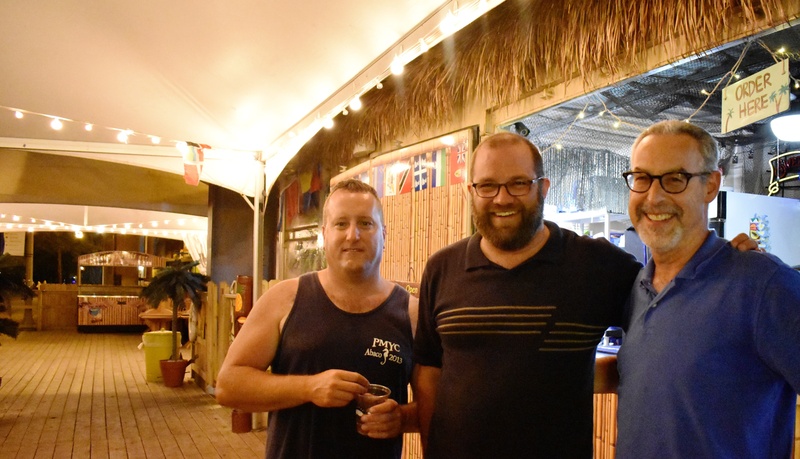 Co-owners Mark, Steve and Joey, along with their manager Mike, can often be found on the docks or at one of the tables, sipping a beverage while keeping an eye out to pitch in and keep things humming like clockwork. While you're at Island Party Hut there's plenty to do right where you are! 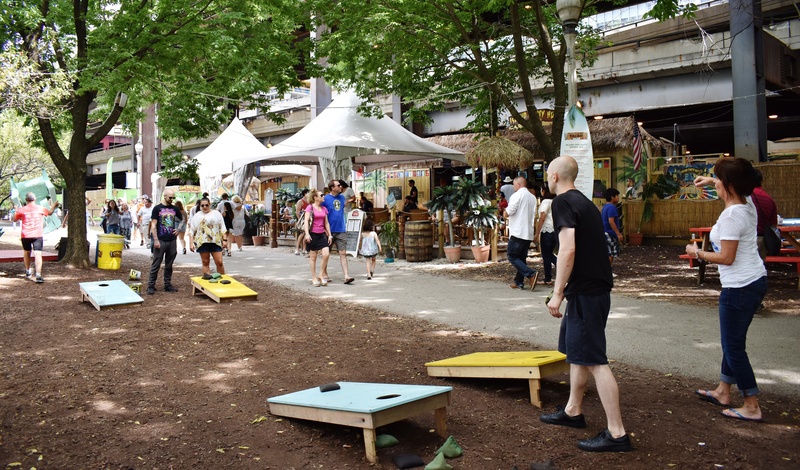 Dive into a game of bag-toss, bocce ball, or Connect 4. People-watch and river-watch while picnicking on the grass. Stay for dinner and make your way through the menu – we highly recommend the Wiki Wiki Root Beer Float. The team at Island Party Hut also run several boat excursions every day to help more people get out on the water. 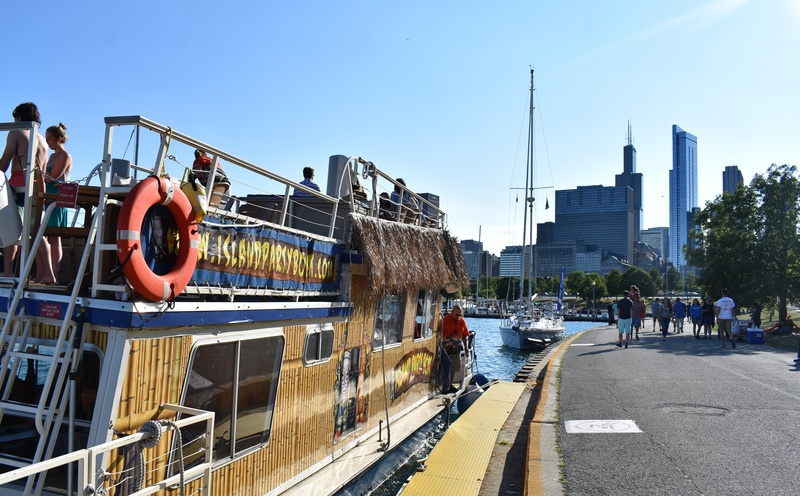 I'm not usually one for rafts, but Island Party Boat is a unique way to experience Chicago. Particularly the monthly Wednesday night cruise that brings guests up the Chicago River, then stops between LaSalle and Park to take in the pyrotechnics fired off from both bridges.